The snow was pretty fresh as in it hadn’t been tracked – but old in the sense that maybe it had a layer of the krusties on top. No matter, because it was certainly fresh underneath. 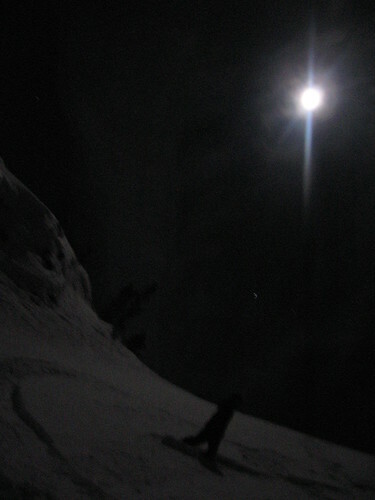 When you tackled the slope, the moonlight gave it an exciting kind of mystery. You didn’t know if you were going to hit a rock underneath or run into one because you couldn’t see – either way it was a different kind of rush than the one you get in a white-out. Our first time coming into the bottom, single-file into a walkway, we managed to avoid (er, ski/snowboard past) a couple walking their dog. We felt apologetic about riding in and surprising them in that way but they seemed unfazed – like it was business-as-usual in a day of the life of a Mammoth resident..
We took turns driving Rob’s truck back down the hill for the pick-up after a total 4 runs down the slope. Nearby, a house party was being had with people watching us from out the back bay window of the house. They yelped and cheered for us as we cheered back. They understood our thirst for a fresh stash. 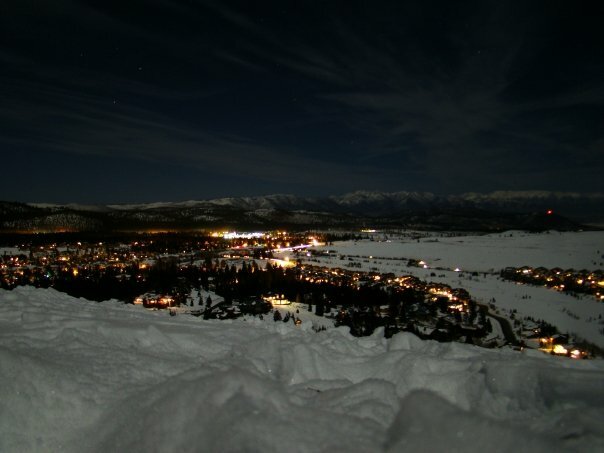 This entry was posted in In the life, Snowboarding and tagged bluffs, mammoth, night snowboarding, Snowboarding. Bookmark the permalink.